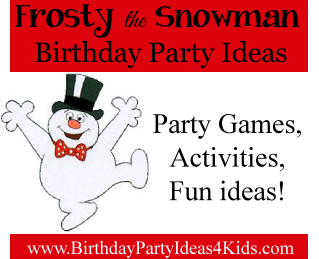 New for the holiday season we’ve added several fun holiday themed birthday party ideas including Frosty the Snowman. This fun party theme is great for kids, tweens and teens ages 1, 2,3 ,4 ,5 ,6 ,7 ,8 9, 10, 11, 12, 13, 14, 15, 16, 17 years old. Boys and girls both love a Frosty the Snowman party. You’ll find fun ideas, party games, activities and more all with a Frosty the Snowman theme. All our great party ideas for Frosty are on one page which makes it easy to pick and choose which games and activities will fit your child’s age and preferences.